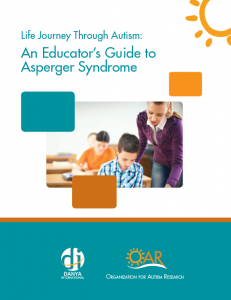 Research indicates that many teachers in the general education classroom feel unprepared to serve the growing number of students with autism. 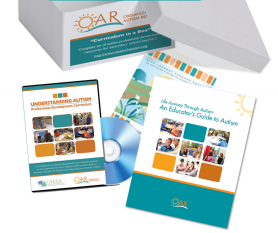 The Curriculum in a Box is an autism resource for teachers that provides school districts, schools, and teachers with the foundational knowledge and effective classroom strategies they need to be better able to teach students with autism. Designed for flexibility, the program can be used by administrators for small staff meetings, facilitators for large professional development sessions, or individuals as a refresher. What is the Curriculum in a Box? 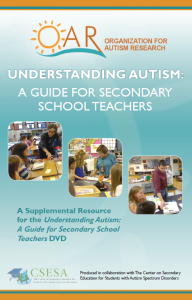 The Understanding Autism: Professional Development Curriculum contains scripted PowerPoint presentations, facilitator notes and handouts, activity worksheets, and video clips. We collaborated with researchers from the University of North Carolina’s Frank Porter Graham (FPG) Child Development Institute to produce a manual for teachers to use in coordination with the video presentation and refer back to throughout the school year. 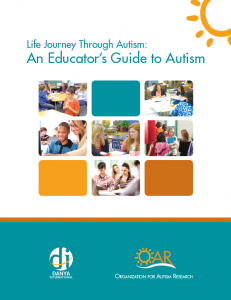 Download this quick reference tool to help address your autism-related challenges in the classroom.